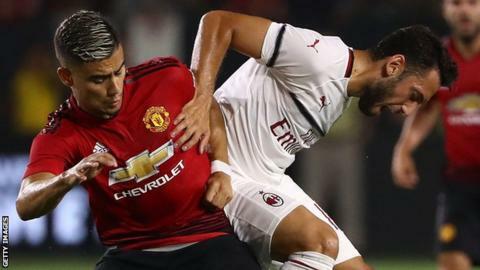 Manchester United will play AC Milan at Cardiff's Principality Stadium on Saturday, 3 August as part of their build up to the 2019-20 Premier League season. The game will be part of United's summer tour. They also face Inter Milan in Singapore on 20 July before taking on Tottenham Hotspur in Shanghai on 25 July. United's tour begins against Perth Glory and Leeds United in Australia on 13 and 17 July respectively. Andy Cole, who won the treble with Manchester United in 1999, said: "It's a lovely stadium. It's a stadium I have fond memories of, having scored the winner here [for Blackburn in the 2002 League Cup final win over Tottenham]. It will be great for the Manchester United fans." Franco Baresi, a three-time European Cup winner with Milan, said: "We're looking forward to a great match-up. "Everything is special about this fixture - a team like Manchester United, a stadium like this. "It will be a great pleasure to play in such a stadium, particularly with a full house. It will be a great stimulus for the players."